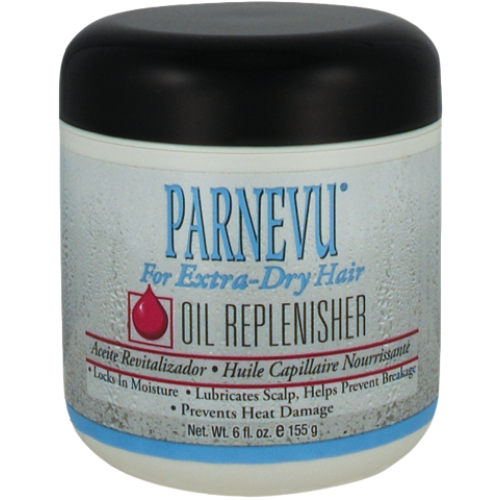 PARNEVU Extra Dry Oil Replenisher is a creamy blend of natural oils and conditioners that strengthens and rejuvenates dry, damaged hair weakened by chemicals and heat styling. Castor oil, Coconut oil, and Lanolin replenished lost to the scalp while adding softness, sheen, and shine to the hair. Directions for Use: Daily Treatment - apply enough to cover the palm of your hand. Rub your hands together and massage into hair. Style as usual. 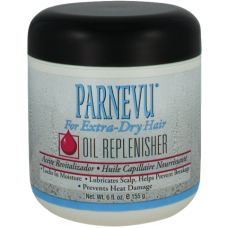 Can be used when heat styling to help prevent dryness and breakage caused by intense heat. Apply a small amount to designated area and style as usual. Performs best on medium to coarse hair or hair that is extremely dry or brittle. Size: 6 fl. oz. / 155 g.
INGREDIENTS: Petrolatum, Cetearyl Alcohol, Polysorbate 60, PEG-150 Stearate, Steareth-20, Lanolin, Sodium PCA, Sodium Lactate, Arginine, Aspartic Acid, PCA, Glycine, Alanine, Serine, Valine, Proline, Threonine, Isoleucine, Histidine, Phenlalanine, Ricinus Communis (Castor) Seed Oil, Cocos Nucifera (Coconut) Oil, Mineral Oil (Paraffinum Liquidum, Huile minerale), C12-15 Alkyl Benzoate, Fragrance (Parfum), Red 17 (CI 26100), Yellow 11 (CI 47000).